Although more than half the field for the International GT race at Mid Ohio Sports Car Course hailed from the great state of Ohio, it was a Maryland resident who swept the overall victories. With the frequent passing thunderstorms on Thursday & Friday, International GT competitors were very lucky with only one slightly damp start to sprint race 2. All would agree this was some of the best racing of the season, highlighted by sprint race 1 on Saturday. Side by side racing was seen throughout the field with great action at the front of the pack as TOM PANK and STEVE HILL (above) staged a fierce battle for overall honors. Pank’s Ultra Performance prepared Porsche would go on to sweep the weekend in the Mission Foods GT3 Cup Trophy category, taking overall wins in both sprints and the enduro. Hill in his Norwood Auto Italia Ferrari commanded the Maranello Cup field winning all three races, followed by a strong performance from BARRY FROMBERG in second position for both sprints and the enduro and COLIN COHEN rounding out the Maranello Cup podium. The unexpected shortening of the enduro and great driving secured Pank’s overall win as Hill’s co-driver JOSH HURLEY ran out of time to challenge for the overall victory (Maranello Cup enduro podium above). The comeback of the weekend was MARK SANDRIDGE (below) Mission Foods GT3.8 Cup Trophy. A tire issue left the front running team in 10th place after qualifying. He was not to be denied a podium finish at his home track with 2nd in 3.8 Class, 3rd overall in sprint race 1 and the enduro. International GT teams and guests enjoyed the hospitality of Sandridge Foods/ Grandma Salads with an amazing BBQ on Friday night. 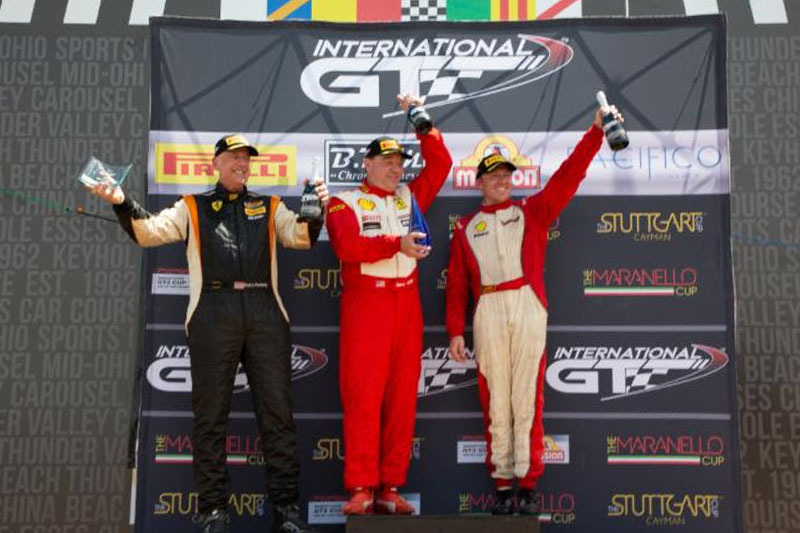 ROBERT WISEN (below left) had his best race weekend of the year in the Mission Foods GT3.8 Cup Trophy category finishing on the podium in all three races in his Gold Crest Motorsports prepared 911. JEFFERY FREEMAN Mission Foods GT3.8 Cup Trophy returned to International GT competition for the first time this year finishing 2nd in sprint race 2. STEVE SCHNIEDER (above right) Mission Foods GT3 Cup Trohpy, 4 liter was first in class in all three races, challenging for top 5 overall positions in each race. ED BAUS swept the Mission Foods GT3.6 Cup Trophy class winning all three races. His Demon Speed Porsche was recognized for a third overall in sprint race 1 as he continues to challenge for the 2018 Mission GT3 Cup Trophy Championship. It was by no means a cake walk for any of the class winners. Baus would feel pressure from TODD SLOAN who finished second in both the Saturday afternoon sprint race and the Sunday enduro with BRIAN HICKS always filling his mirrors. BRAD WAITE finished on the podium in both sprints and just one step off in the endure, while LUKAS PANK finished third in Sunday’s enduro. Above just some of the Ohio based competitors who joined IGT at Mid Ohio. 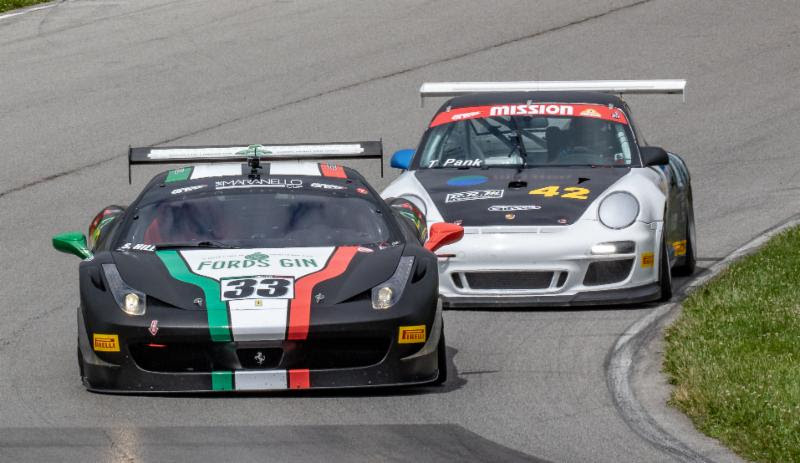 International GT welcomed newcomer CAMERON MCINTYRE (above left) to the series with on- track competition from RANDY CASSLING (above right), JOHN HIGGINS and BRANT GIERE in the, Mission Foods GT 3.6 Cup Trophy class. Cameron won both sprint races in the Stuttgart Cup Porsche Cayman category. 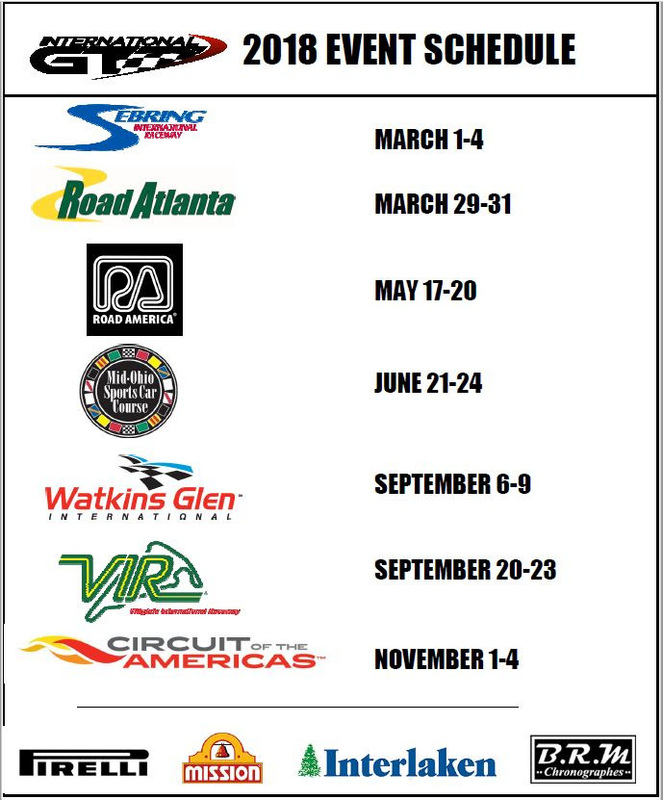 We hope to see Cameron and a full field of drivers when International GT returns to competition at Watkins Glen on September 6-9, 2018.